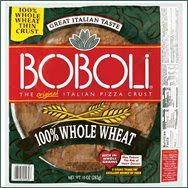 Since I have been on South Beach, pizza is pretty much off limits for me, but once in a while, we make a Boboli all wheat crust with a variety of toppings. If you use low fat cheeses and lots of vegetables with some olive oil, it is quite an easy, healthy treat. Boboli does all the work. They get popped in the oven for ten minutes until things are melted and bubbly. It is a great weeknight meal and healthier than delivery or frozen. Here are two recipes we like. Preheat oven to 450˚. Put crust on a pizza sheet or stone. In a pan, heat olive oil and cook garlic until softened. Add red onion and peppers until softened. Then add the portabellos and cook until starting to release juices. Take veggies off heat. Spread pesto evenly over the crust. Sprinkle chicken evenly over the pesto. Then add the veggies evenly over the chicken. Sprinkle with grated Parmesan. Then add the provolone slices. Pop in the oven for 8-10 minutes. Let rest 2-3 minutes and then cut into slices. Preheat oven to 450˚. Put crust on a pizza sheet or stone. In a pan, heat olive oil and cook garlic until softened. Add onion and cook until softened. Add the peppers, and cook until starting to soften. Then add the mushrooms and seasonings. Cook until mushrooms start to release their juices. Take pan off the heat. Ladle the sauce on the crust. Then spoon veggies evenly over the sauce. Sprinkle with mozzarella and Parmesan. Pop in the oven for 8-10 minutes-or until cheese is bubbly and golden. Let rest 2-3 minutes and then cut into slices.